History:Originally named Kakarotto (カカロット, Kakarotto?, addressed as Kakarrot in English adaptations), Goku is born a member of a fictional race of extraterrestrials called Saiyans. Shortly following his birth, Goku is sent from his home, a fictional planet named Vegeta, to prepare Earth for sale on the intergalactic market by destroying all its life. Due to an injury to his head that caused him severe amnesia, Goku forgets his purpose, and instead focuses on becoming stronger for little more than the pleasure of it. Goku meets a brilliant teenage girl named Bulma, the desert bandit Yamucha, and two shapeshifters named Oolong and Pu-erh. As the series continues, most of the characters introduced are basic parodies of characters found in Journey to the West. He also encounters one his closest friends, Kuririn, and others during his training. Participating in several Tenkaichi Budokai, Goku also battles foes-turned-allies such as Tenshinhan and Chaozu, as well as Piccolo Daimao's offspring of the same name. 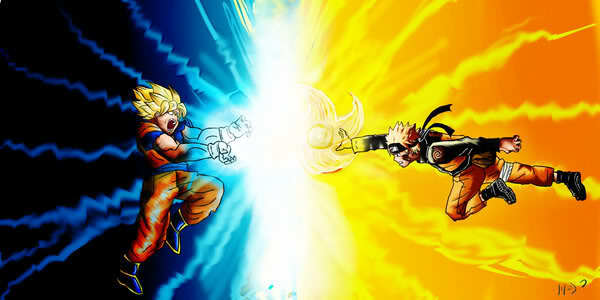 During his early adulthood, Goku meets his older brother, Raditz, an encounter that results in his death. Following the wish for his revival from the Dragon Balls, Goku continues to face other enemies thereafter linked to his heritage, such as Vegeta and Freeza. As the series continues, the focus on Goku's past is shifted away from as new enemies are introduced simply as threats to the fictional universe. After his encounter with Freeza, Goku trains his child, Son Gohan, to be his successor. Goku sacrifices himself during the battle against Cell, leaving Gohan to succeed him. Goku returns several years later from the afterlife to visit Earth, however is drawn into a battle for the universe against an extraterrestrial genie named Majin Boo. During the Tenkaichi Budokai ten years after Boo's defeat, Goku meets Boo's human reincarnation, Oob, and takes off with him in the end of the story, intending to train him as a successor (until Dragon Ball GT) after realizing that his previous successor, Gohan, had prioritized his education over his fighting. Through constant training, Goku has achieved many abilities; aside from his great strength, he also possesses super speed (first seen when as a child), reflexes, and the power to fly using chi, a fictional energy force in the series. Goku's signature technique is a chi energy blast called the Kamehameha, which he learned from Muten Roshi. Another signature technique of his is an attack that multiplies the user's chi for an instant, called the Kaiô-ken, taught to him by North Kaio. Goku's most powerful attack is the Genki Dama (renamed the Spirit Bomb in most English adaptations), a sphere created by gathering chi energy, which he also learned from North Kaio. Goku also learns a teleportation skill called Shunkan Idô (renamed Instant Transmission in most English adaptions), which he learned from the inhabitants of a fictional planet called Yardrat. Goku is also the only Saiyan in the series to achieve all the Saiyan transformations seen in the manga. In Dragon Ball, he is able to shapeshift into a gigantic ape called an Oozaru, albeit after his Saiyan tail is removed by Kami, he no longer achieved this form. During the events of Dragon Ball Z, Goku is the first Saiyan to achieve the fabled Super Saiyan state in over a millennium. He ascended to Super Saiyan after being overcome with rage by the murder of Kuririn by the hand of Freeza. After several years of training with his Super Saiyan form, Goku completely overcomes the negative characteristics of the transformation in order to combat Cell. After his death against Cell, Goku continues his training in the Otherworld for seven years, and achieves both Super Saiyan 2 and Super Saiyan 3. In Dragon Ball GT he achieves the final Saiyan transformation, Super Saiyan 4. Goku is also able to perform a fusion technique with Vegeta in two ways: one by earrings called potara, creating Vegetto. The other by fusion dance, creating Gogeta.